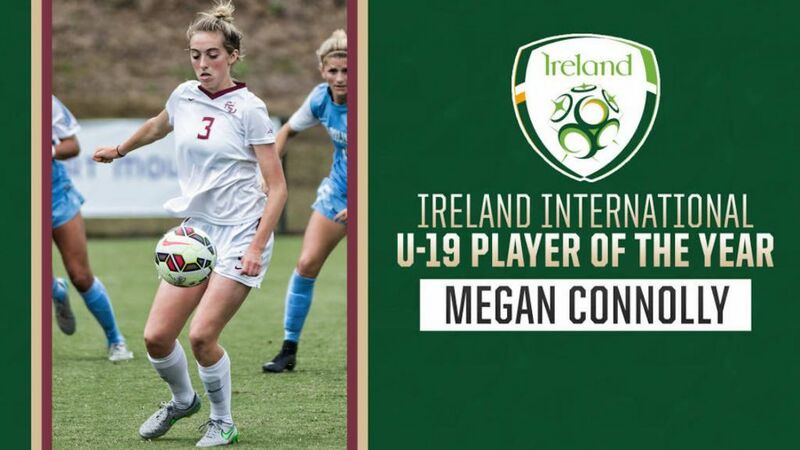 TALLAHASSEE, Fla. – Following a freshman season where she earned almost every accolade she was eligible for in the United States, rising sophomore Megan Connolly received one of the highest awards from her home country of Ireland on Sunday as she was named the Under-19 Women’s International Player of the Year by the Football Association of Ireland. It is the second consecutive year that Connolly has won the award and she becomes the first woman in the history of the award to be a two-time honoree for FAI U-19 Women’s Player of the Year. Connolly made an immediate impact in her first year of collegiate soccer and became the first FSU freshman to be named a First Team All-American by the National Soccer Coaches Association of America in 2015. Leading the team with 28 points on nine goals and 10 assists, Connolly also earned ACC Freshman of the Year and ACC Midfielder of the Year accolades. She was also selected as TopDrawerSoccer’s National Freshman of the Year. She made multiple trips during the fall to play with the Republic of Ireland U-19 team, highlighted by a four-goal performance in a 6-0 win over Bulgaria on September 17, 2015. Connolly made her first cap with the senior national team on January 23, 2016 in a friendly match against the United States Women’s National Team in San Diego, Calif.
She also participated recently with the Republic of Ireland Full National Team at the Cyprus Cup from March 2-9. She played in four games and started two matches as Ireland finished in seventh place in the tournament.